Sometimes you have to accept that some of the things that you love and hold dear will simply repulse other people. Perhaps your partner has a face like a poorly shaved badger but that’s just your thing or maybe you’re really into 1Direction and really don’t give toss that they’re a cancer upon the name of anything calling itself music. In the case of The Star of Bethnal Green I have to concede that although it is a pub I love more than I could possibly love a human baby it will provoke a reaction from some like George Osborne embracing a poor person. 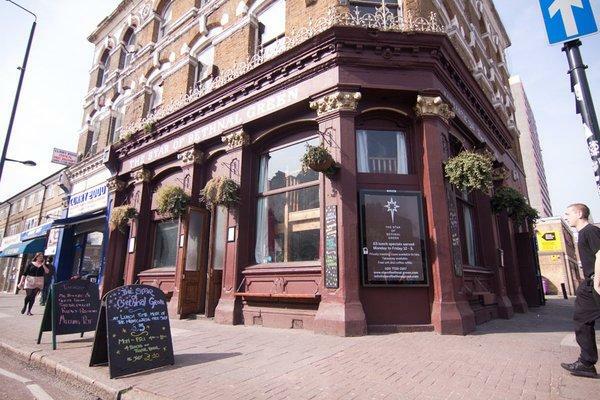 This is a pub for the East London crowd and it unashamedly describes itself online as ‘The Grown Up Raver’s Boozer of Choice’. Given that I avoid at all costs speaking to members of the general public unless I’m being paid to do it I can’t confirm that the clientele consists mainly of ‘ravers’ but my observations suggest that the crowd is heavy on the trendy, ‘hip’ and creative types that gravitate towards Shoreditch and the areas around Brick Lane. If your idea of a good pub is one where you can compare beards and talk about the Pennines then steer clear but if you favour a waxed moustache and a wardrobe comprised mainly of things professing to be ‘vintage’ then head on down. Although warm is a word I would use unreservedly to describe the welcome at The Star (the staff are universally fantastic) it is not appropriate to use it to describe the temperature. Those enjoying a little bit of cancer outside seem to be incapable of closing the door properly on re-entry rendering sitting anywhere near said portal a frustrating experience in Autumn/Winter (most of the year given that this is England). It is however roomy and comfy with a nice medley of seating options allowing you to slouch with a pint on a fashionably dilapidated sofa or enjoy a bit of nosh at a proper table all the while enjoying the notably eccentric decor. Big plus points for The Star have to be given for the effort it puts into being a ‘venue’ rather than a mere pub. Its weekly quiz is hosted with aplomb and is never lacking for originality in it’s rounds or generosity in it’s prize. Weekends can see it transformed into something closer resembling a club in the small hours after being a suitable place to watch whatever apparently important footballing match might have been staged that day. As much as my personal tastes lean me towards rating The Star higher it is not enough of a classic pub or an all-rounder to elevate it to a loftier score. But I urge you to give it a go and perhaps it will win you over with its eclectic mix of charms the way it’s won me.